First Stelmach, then Morton ... is Swann next? CALGARY – There may be yet another bombshell dropped by a high profile Alberta politician this week. Last Tuesday, Premier Stelmach announced he will resign at the end of the next legislative session. Two days later, Ted Morton resigned from cabinet in order to run in the PC leadership race. This time, it could be a member of the opposition party. Global News has learned that David Swann is talking about stepping down as Liberal party leader. He discussed his resignation with party executives and caucus members over the weekend. Jim Dinning, Saturday: "I never say never." Suffice to say Ed's gambit of naming Morton Minister of Finance last year didn't work out so well, eh? Alberta Finance Minister Ted Morton has resigned from cabinet, two days after first planning to do so and after reluctantly agreeing to support a large deficit budget. A source tells The Globe and Mail Mr. Morton resigned on Thursday, but remains in the PC caucus. Tuesday, Stelmach sounded the starting gun on the PC leadership race. With today's announcement, Morton is the first out of the blocks. Morton's resignation should come as no surprise. He plans to run in the leadership race as a fiscal hawk, and after he wins that, he'll run in the next election as a fiscal hawk. Bringing in another deficit budget won't do him any good. Neither will running a large government portfolio - not when there are campaign teams to be assembled, membership forms to be sold, and theme songs to be written. ...come two of the most ridiculous political ads of the last decade. It's one thing to take quotes and clips out of context. It's another to take them out of context in the way Rick Mercer would. Just because you're able to splice something together in 48 hours, and just because you have the money to air them, and just because it's funny to four frat boys in the CPC war room, it doesn't mean you need to do it. But that's not what makes these ads ridiculous. What makes them ridiculous is the Tories are running up against a guy who is seen as an aloof, wooden university professor. So they show clips of him fired up, full of passion. UPDATE: And the Tories pull the ads. I'm sure you'll all join me in a hearty round of "YES! YES! YES!" Shouldn't we really be blaming the Nova Scotia Liberal government who designed his grade 5 curriculum? Defence Minister Peter MacKay might want to give his old Grade 5 geography teacher a call for a brush-up. MacKay made a bit of a gaffe Tuesday night, when he stated British Columbia shares a border with California when he posed a question to the state's former governor, Arnold Schwarzenegger. The "Terminator" actor politely quipped that Oregon and Washington happen to exist between B.C. and the Golden State. 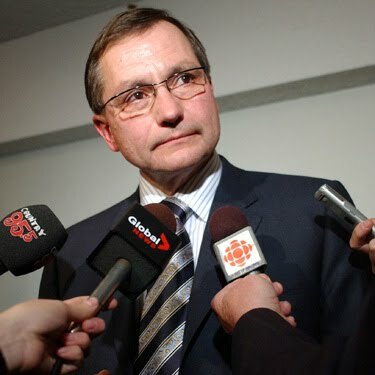 The only thing more surprising than Ed Stelmach's ascension to the Premier's seat was his departure from it. 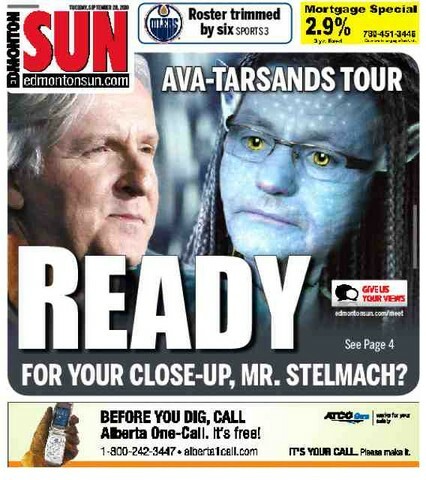 In effect, "surprising" would probably be the best way to sum up Stelmach's time as premier. Or "baffling". Or "incomprehensible". After all, the most boring politician the world has ever known gave Alberta five absolutely thrilling years in politics. In Alberta, that's no small feat. 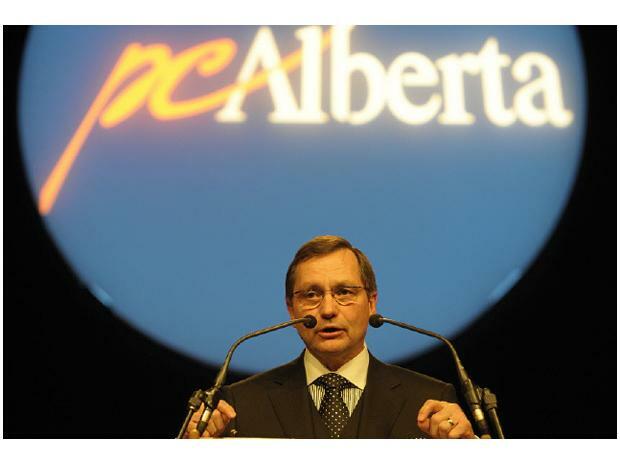 To understand Stelmach's time as Premier, it's important to first understand that he should never have become Premier. Elected as PC leader the same day Stephane Dion was elected LPC leader, Stelmach's story was very much the same as Dion's. He'd proven himself to be a mostly competent Cabinet Minister, apart from one time when as transport minister he floated the idea of moving the "fast lane" on the highways to the right. He was an afterthought to most in a crowded leadership race with 8 candidates. Still, he found himself in third place with 15% of the vote after the first ballot and, with members tired of a lengthy fight between two flawed frontrunners, Stelmach surged up the middle to win. Sound familiar? The only difference between Stelmach and Dion is that Dion probably spoke better English. But the thing is - it would still be worth going to that final press conference because, if you could fight through the urge to gauge your ears out, you'd probably catch a gem. Like the time when he called the Calgary Stampede, "the Alberta Stampede". Oops. So how did the Great Miscommunicator do it? How did he win a Klein-esque 72 of 83 seats in his first election? A good question, and one without an obvious answer. Hence my description of Stelmach's political career as "baffling". Personally, I'd chalk it up to Ed being a decent guy and the lack of alternatives - remember, this was before Danielle Smith learned to walk on water. Albertans were fairly happy with how things were going so why mess with a good thing? And that's basically how Stelmach's tenure as Premier went. He wasn't as exciting as Ralph. He wasn't the leader Lougheed was. But he also didn't mess up like Getty. There were no big scandals - a few sexist tweets by a caucus member, a silly fight over domain names, a screw up on tourism pamphlets - this is hardly the stuff that brings down governments. Yes, he took the province into deficit - but who didn't? Which brings us to the second riddle of Ed Stelmach's career - why pack it in? The obvious answer is that the party didn't want him. To outsiders, that may be hard to understand. The man gained 10 seats in his first election. Yet he only picked up 77% in his leadership review, and endured constant criticism from his MLAs and party members. Was this because Progressive Conservatives were worried about the Wildrose Alliance ending their dynasty? I'd argue it was the exact opposite reason. When you're in power for 40 years, winning elections becomes an afterthought. Instead of worrying about the opposition, you look inwards. 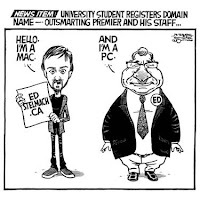 Remember, Stelmach was a guy who won the leadership with 15% of the party behind him. It's not surprising that some people inside the tent weren't fans of his. I remember talking to a PC friend of mine last year and he was sure Stelmach wouldn't make it to the next election, due to pressure from the caucus, the party, and (most of all) the fundraisers. I laughed, but it looks like he was right. Another possibility is that Stelmach just didn't like being Premier - he never looked like he enjoyed it the way Ralph Klein clearly did. After a slew of uninspiring budgets, it was obvious he didn't have any great ambitions for the province. Most people who follow politics roll their eyes when politicians say they want to spend more time with their families but...is that really so hard to believe? I suppose we'll never know the real reason Stelmach left. Which is fine. His entire career defied political common sense and the easy explanation - it seems fitting his retirement should too. CALGARY — A high-ranking source says Alberta Premier Ed Stelmach will announce Tuesday he will resign as premier after the legislature session and won't run in the next election. Stelmach has called a news conference for Tuesday afternoon, and a source said he'll announce the decision then. • No one needs to be stampeded into a decision. Lets all take the time to get this right. • The danger is that it could allow for an extreme right party to disguise itself as a moderate party by focussing on personality – on me personally. You can also find Taylor's signature on a contract promising to do what he describes above, here. So we've got the PCs with 67 MLAs. The Liberals with 8. The Wildrosers with 4. The NDP with 2. And Raj Sherman doing his own thing. And now, the Alberta Party joins the big leagues with their first MLA - former Liberal Dave Taylor. Opposition parties are quickly becoming Alberta's largest industry, after oil and beef. So what does this mean? Well, the Alberta Party recently launched a leadership race and it now seems a given that Taylor will be their next leader. Taylor quit the ALP after losing to David Swann so I certainly can't imagine his ego withstanding life as a backbencher in a one-seat party. And given Taylor's gift of the gab and relatively high profile, it's hard to see how the Alberta Party wouldn't want him as their leader. With a one-man caucus at the moment, it's unlikely the Alberta Party will be immediately recognized as an official party in the legislature - the unofficial rule seems to be "it takes two". However, a viable Alberta Party is certainly in the PCs' best interest, as it carves up the ALP's vote, so I wouldn't at all be surprised to see Stelmach's gang doing all their can to give the AP added legitimacy and resources. Five years ago, we all watched Stephen Harper become Prime Minister - an idea which seemed uterly ridiculous a mere 6 months earlier. For about two weeks, everyone who liked politics started talking in staccato: “There’s no mayonnaise. On my sandwich. No mayonnaise. In Canada. I’m not making this up. I’m not allowed to make this up.” I went to a model parliament the weekend after the election and there were 12 "soldiers in our streets" jokes during the first 5 minutes of our mock question period. The first (which I can’t find a video for anywhere) was released at a time when things seemed to be going well for the Liberals. They were up by 5 or 6 points in most polls (and a dozen points in most Ekos polls). Yes, there had been the beer and popcorn gaffe. But Harper had released his entire platform and it hadn’t exactly lit the world on fire. But the signs were all there. Sure, people said they’d vote Liberal, but Stephen Harper had caught up to Paul Martin on the best PM question, and voters paying attention to politics were flocking to the Tories. People were ready for change after 13 years, and the ad played on those feelings. The second ad was released the first day after the Christmas holidays, right after the Income Trust investigation had been announced. It played on the corruption theme perfectly and, having already announced a relatively unscary platform, Harper was now free to go neg. From there, the Liberal campaign went into free fall. No matter how perfectly clear Paul Martin made himself, the media decided Liberal policy wasn’t quite as exciting as the Liberal mole and sagging poll numbers. John Duffy and Mike Duffy went at it on air before the debate. (Imagine that! A Liberal strategist daring to question the journalistic integrity of Mike Duffy.) Later that night, Paul Martin launched his often-ridiculed notwithstanding clause hail mary. Not that it really mattered, since everyone was busy talking about the aforementioned soldiers ad. So it looked for a while like Harper might get that majority, but the man has always been kind of like BJ Ryan when it comes to closing the game. So he complained about the liberal civil service, judiciary, and senate. This was back when the “Stephen Harper Bogah Bogah!” tactic still had some resonance, so he was denied the landslide many had expected. Despite those late stumbles, it was still a beautifully run campaign by Harper, and the election I would use as a case study if I were ever teaching a first year Poli Sci class. Sure, there were gaffes and the income trust wild card, but I don’t think those made a difference. Rather, the Tories understood the mood of the electorate and played on it. They controlled the agenda from day 1 – getting ugly issues out of the way early, then rolling out daily policy announcements early each morning to control the day's media cycle. This served as an early inoculation against the hidden agenda attack, allowing them to go for the jugular on the corruption issue after Christmas. They had popular policies and could tell voters how those policies would impact their lives. They were well prepared but willing to adjust and call the occasional audible – when Martin challenged Duceppe to a national unity debate then backed down, Harper volunteered to fill in. When Harper moved from challenger to front runner for the second round of debates, he changed his tone accordingly. It may not have been the most exciting, the most shocking, or the most important election in our nation’s history (I’m sure Paul Martin would disagree). But it was far more memorable than the 2000, 2004, or 2008 campaigns, which failed to crack the top 10 of this list. And it’s not hard to argue that the change from Liberal to Conservative government was the defining political moment of the decade. Hot off the presses, just 25 months after he was named party leader, it's an introduction to Alberta's leader of the opposition, David Swann. Notice the strong emphasis on Health Care in the video which, coupled with Swann taking over as ALP health critic in yesterday's shuffle, certainly tells you what the ALP intends to focus on in 2011. And good on them for that. Health Care is a big issue, the PCs appear vulnerable on it, and it's an issue where Swann has some credibility. It's something the Alberta grits should be hammering away at on every opportunity. After a slew of Tory ads on Monday, the Liberals have countered with a pair of their own. Yes, these are attack ads - dark, both in colour and message. But it's a substantiated attack. Harper IS bringing in a corporate tax cut and he IS buying the fighter jets. Those are facts. There are certainly valid reasons for making both decisions, but that's the debate we should be having. Contrast that to the Tory ads which were nothing more than drive-by-smears on Ignatieff. Or, for that matter, some of the character assassinations the Liberals tried on Harper in past elections. As for the ads themselves, they'll sink or swim on the issues they discuss, but they're certainly well produced. The flying jets and sound effects get your attention (remember the car honk at the end of those great CPC ads in the '06 campaign), as do the coloured dollar signs up against a grey background. Of the two, I think the corporate tax ad is more powerful. The rising cost of living line is something everyone can relate to (first seen last week). It's easy to grasp the idea of a big tax cut for corporations (notice the stretch limo) at a time when you're having trouble making ends meet (notice the frustrated family). Probably more so than spending on military planes which we may or may not need. So, on the whole, a very strong response from the Liberals. Yesterday, I looked at the new round of Conservative attack ads en anglais. Today, a look at the four new French ads - a rare glimpse of Harper's Quebec strategy which, let's be honest, never really lived up to expectations. 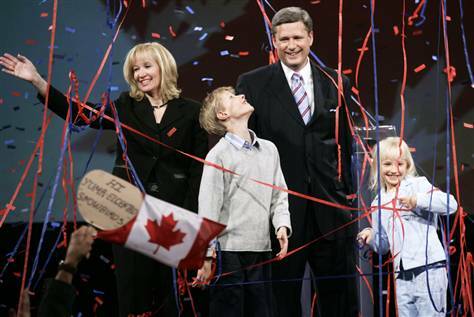 Since everyone has gone all nostalgic for 2006, let's remember that Harper picked up 10 seats and 25% of the vote in Quebec that campaign. Since then? He usually polls in the teens and one of the few safe seats in the province is held by an MP who goes rogue more often than Sarah Palin. So what's the plan to turn it around? Faire face au défi: Like the English version, this ad emphasizes Harper's steady hand in turbulent times - clearly, this will be the Tory pitch in both official languages. On the same vein, "fardeau fiscal" is really just a french version of the tax attack. This one features Liberals Justin Trudeau, Nancy Charest, and (surprise!) Denis Coderre bad mouthing Ignatieff. 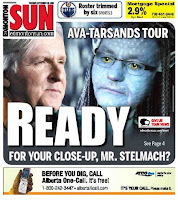 The Trudeau clip is from the '06 leadership - I pointed out how ridiculous it was to use that clip when the Tories ran version 1.0 of this ad in 2009. This time around, all I'll say is that telling Quebecers someone named Trudeau and someone named Charest don't like Ignatieff might actually do wonders to help Iggy in La Belle Province. In it, Duceppe is attacked as being "too Montreal" - I'm sure Larry Smith can't wait for this one to air. The tag line of "notre region au pouvoir" is more proof the Tories will be running a very regional campaign in Quebec...and that region won't be Montreal. We already know Stephen Harper can play a few songs on the piano. Today comes confirmation that Michael Ignatieff is able to skate. Next week, Jack Layton bakes a cake, to prove that he has what it takes to lead Canada. In all seriousness, this video is gold - not just because of the skating or the kids, but because Ignatieff looks like he's got energy and looks like he's having a great time. $10 says some of these clips find their way into a Liberal commercial next election. OTTAWA — Keith Davey, the former senator and legendary Liberal organizer, died peacefully on Monday morning, surrounded by his family in Toronto. He was 84. Known as the “Rainmaker” for his formidable, winning political strategies, Davey came to national prominence in the early 1960s, when he arrived in Ottawa to help bring the Liberal party out of the opposition wilderness and back into government. “He had a talent for mobilizing and motivating people, for making problems seem readily soluble, for optimism in the face of disaster,” Christina McCall-Newman wrote in her book Grits: An Intimate Portrait of the Liberal Party, still seen as the authoritative text on modern-day Liberal party history. Part of Davey’s strategic success was also rooted in his ability to learn from sophisticated political innovations that were arriving on the scene in the United State in the 1950s and 1960s — polling and TV advertising in particular. According the Conservatives, Michael Ignatieff's cross-country tour is a sign he wants to plunge the country into a divisive election, something Stephen Harper has consistently opposed ever since September 2008. So the Conservatives have responded the way they respond to, well, anything - by launching a new round of remixed Just Visiting attack ads. So let's take a look at the 6 English ads up on the Conservative Party website - tomorrow, I'll break down the 4 French ads. This video starts with shots of economic uncertainty and rioting in a third world country (or perhaps Toronto) to show it's a dangerous world. We then see Stephen Harper, in glasses, seriously reading papers and hard at work. After all, being PM is a serious job and we need a serious leader - one who is "here for Canada". On the whole, the ad has a positive message, touting Stephen Harper's record in office and giving voters a reason to vote for him. So, of course, it will never air on TV. Coalition: Michael Ignatieff wants to form a coalition with the separatists and socialists? And Jack Layton too? Why hasn't anyone warned me about this before?!?!? I feel like some of the money wasted on H1N1 awareness ads last year should have been spent to let Canadians know about this dastardly threat. Taxes: Michael Ignatieff wants to raise taxes. But not the good kind of tax increase, like the hike in EI premiums Jim Flaherty is bringing in. Ignatieff is proposing bad tax increases, like a hike in the GST or a carbon tax. Except he's not so much "proposing" them as kind of musing three years ago about not ruling them out. Ignatieff Canada: Again, we find out that Michael Ignatieff likes Algonquin Park and has said some not-so-great things about Canada in the past. It's really "Just Visiting" with a new tag - "he didn't come back for you". Which I think just underscores why it's important for Ignatieff to offer a clear vision and explain why he wants to be Prime Minister. Ignatieff America: Turns out Michael Ignatieff loves America. Unlike Stephen Harper. Overall, it's hard to say much about these ads that hasn't been said before because, well, we've seen these ads before. As trashy as they are, there wasn't a huge backlash to them the first time around, so I wouldn't expect one now. They worked before, so I would expect them to work again. Until Ignatieff defines himself better, Harper will gladly do it for him. And thus concludes a week in politics I would describe as more "typical" than any other over the past two years. -Election speculation, election speculation, and more election speculation. Harper may or may not be trying to engineer his own defeat (be sure to check off "poison pill" on your minority government bingo sheets), Ignatieff's may or may not bring him down, and Gilles Duceppe is asking to be bought off. -Harper's talking about scrapping public subsidies - which we've known would be in his next election platform since...oh, I don't know...2008. And he's warning about a coalition. We get it. Socialists! Separatists! They'll destroy Canada. -Quebec, who have only goten 40% of military contracts so far, feels its not getting its fair share. -Even the polls, always a good source of faux excitement, were as typical as can be this week. Tories up by 7. Tories up by 6. Yawn. We're inevitably going to see a slew of "5 year anniversary" articles later this month...after all, there's only so many election speculation columns one can write before they become insufferable, not just to the reader but to the columnist writing them. To get a jump on this, the Liberals have released their recap of the Harper years, focusing on the rising cost of living, and how it's impacting Canadians. On the whole, I like the document's direction - even though the question up front is about Canada, the pamphlet focuses on the concerns of individual Canadians, rather than the health of a country as a whole. Which makes sense, because Canada as a whole is looking pretty good these days (minus our third period meltdown against the Russians of course) - but a lot of individual Canadians are still struggling. And politics is all about individuals. The Conservatives figured that out a long time ago, which is why we see home reno and child sports tax credits, rather than programs to improve productivity and cut greenhouse gases. It's encouraging to see the Liberals keying in on that same idea. VICTORIA — The B.C. Liberal Party's effort to ration membership forms during its leadership race has provoked a backlash from candidate Christy Clark, who is concerned that she may not be able to sign up enough supporters before the Feb. 4 deadline. The party executive held a summit Thursday evening in hopes of resolving the issue, where it agreed to increase the number of available sign-up books to 240 per campaign — or 6,000 individual forms — from the previous limit of 120 books. But Clark's campaign continues to question the need for a limit at all. "Our first question is why would anybody restrict the number of membership books available to sign up members to the party?" asked Clark campaign co-chair Sharon White. "They're allocating less than three books per riding," she added. "We're not being able to give our volunteers the tools they want and that they're asking for to be able to get people involved and enthused about the campaign and the leadership and the B.C. Liberal Party." Bloy added that in addition to the books given to each campaign, MLAs and riding association presidents also get access to a limited number of additional books, giving the advantage to those campaigns that have endorsements from a large number of sitting MLAs. A relative outsider to the Liberal party apparatus of late, Clark has Bloy as her only caucus supporter. Martin, the undisputed front-runner to succeed Chretien, has been accused of having an unfair stranglehold in the race because he controls the vast majority of riding associations in the provinces of Ontario, Alberta and British Columbia. As a result, critics charge, Martin's supporters are preventing those who might favour his opponents -- Finance Minister John Manley and Heritage Minister Sheila Copps -- from joining the party and becoming delegates that would ultimately elect a new leader. The restrictions prompted leadership hopefuls Deputy Prime Minister John Manley and Heritage Minister Sheila Copps to cry foul and accuse the Martin camp of controlling access to memberships. Two weeks ago, B.C. lifted the restriction and replaced it with a limit of 100 memberships per candidate per riding, but added a cap of 1,000 forms at a time. -Harrington, Carol. Canadian Press NewsWire. Toronto: Feb 1, 2003. In three of the country's four largest provinces, Ontario, Alberta and British Columbia, access to membership forms -- the only mechanism for increasing the size of a party faction -- is controlled entirely by supporters of Paul Martin. In those provinces, the Martin forces are signing up new Liberals by the thousands. They will vote overwhelmingly to boot Mr. Chretien out during votes in every riding, beginning this November. Organizers loyal to Mr. Chretien, meanwhile, are systematically stymied in their attempts to get blank membership forms. Mr. Martin's advantage over Mr. Chretien grows by the day. The last round of by elections served as a good reminder of what unpredictable creatures they can be. The Tories took a riding they hadn't held in 22 years, with the Liberals winning a Manitoba seat they got just 9% of the vote in last election. This should heighten interest in the upcoming Calgary Centre-North by election, even if the Liberals' Alberta co-chair concedes "you could move the federal capital to Calgary and they still wouldn't vote for you". There's probably some truth to that, though I do think there are probably some things the party could do outside of blatant pandering that might get them in the game in Calgary. And if they ever do those things, Calgary Centre-North is certainly a riding to watch. 1. Prentice is a red tory, and a popular one at that. 2. Centre-North contains much of the old Joe Clark Calgary Centre - a riding that scared the Conservatives so much, they had to destroy it during the last round of redistricting. 3. Provincially, it contains much of the Calgary Mountainview electorate that has given David Swann over 50% of the vote in the past two provincial elections. 4. When I ran a demographic regression analysis, Centre and Centre-North came out as the two worst ridings for the Conservatives in Calgary. So this is all to say Centre-North is one of the more interesting Calgary ridings, but that's kind of like saying blue is one of the more interesting colours of paint to watch dry. And as the slate of candidate slate rounds itself out, the by election has gotten even less intriguing than before Christmas when there was (albeit far fetched) speculation about a Dave Bronconnier versus Ric McIver cage match. Instead, Michelle Rempel was acclaimed as the Tory candidate. Rempel has a solid bio and I presume she's well organized and well connected given how no one else bothered to run for the nomination in this safe Tory seat. But she certainly lacks the "star" power it takes to get the Ontario press gallery interested in a Calgary by election. Carrying the Liberal banner will be 66-year old University of Calgary professor Stephen Randall. Randall has an impressive bio and it wouldn't at all surprise me if the grits came across him when amazon.com said "if you like Michael Ignatieff you'll like these books by Stephen Randall". But he's certainly not a household name by any means. The Greens, who came within 14 votes of second place in the last election, will put forward Heather MacIntosh as their candidate. Heather, according to her official bio, "enjoys her book club and Flamenco dancing, and is a strong proponent of fair trade". We still don't have an NDP candidate, though John Chan has been this riding's man in orange for the past three elections. As for when Calgarians will go to the polls? Well, judging from the Pundits Guide round-up, it would appear that a call is likely by April 20th, so as to lump it in with (at least) two other by elections. That's assuming the rest of the country isn't thrown into an election before then. Stephen Harper has appointed Toronto MP Peter Kent as Environment Minister, giving the former TV broadcaster the task of selling the Conservatives' controversial approach to fighting climate change. He's also given former Ontario Provincial Police commissioner Julian Fantino a junior cabinet post, making him minister of state for seniors. Diane Ablonczy, formerly the seniors minister, becomes Minister of State of Foreign Affairs (Americas and Consular Affairs). And Ted Menzies, formerly parliamentary secretary to the Finance Minister, is appointed Minister of State (Finance). Kent gets promoted and Fantino gets a cabinet spot (setting up Rick Mercer for a great "Fantino - Tough on Seniors" tweet). This is being interpreted as Harper courting GTA voters. Ablonczy and Menzies get in, which is good for Alberta and good for anyone holding a "Z" tile in Cabinet Minister Scrabble leagues. This has not been interpreted as Harper courting Alberta voters. On the whole, it's hard to find much fault with these selections - those getting promoted are either competent or stars. My suspicion is that none of them will ever fall in the intersection of that Venn Diagram, but we shall see. So how much did you pay attention to politics last year? Given the kind of year it was, I sincerely hope the answer is "not much". But if you want to reminisce about the year that was, you can take my year in review quiz*. 1. Which city's airport did Helena Guergis call a "hell hole"? 2. Which cabinet minister got into a heated argument after trying to bring a bottle of tequila onto an airplane? 3. Which Premier flew to the US for heart surgery? 4. Whose sexting inspired the "A Fare to Remember" newspaper headline this spring? 6. When not turning water to wine, Danielle Smith leads the Wildrose Alliance, a party threatening to topple the 40 year PC dynasty. How many MLAs does the Alliance currently have? 8. Who did James Moore christen as "Canada's Team" a week before their exit from the NHL playoffs? 9. In which of the following cities were incumbent mayors defeated this fall? 11. What reason did Stockwell Day give as a reason for spending 11 billion dollars on new prisons? A. "This is part of the stimulus program." B. "We need a place to put the Liberals connected to Adscam." C. "We're very concerned about the increase in the amount of unreported crime." D. "Boy, crime, I dunno." 12. The Ottawa Sun praised the naming of David Johnson as Governor General for which of the following reasons? 13. What 2010 event did Larry Smith call a "catastrophe"?